When she was much younger, we purchased small bows at Gap and Gymboree. To keep up with Avigail’s ever-evolving fashion criteria, we tried finding new bows at the local accessory boutique. These hair bows are expensive and ordinary and many of them no longer pass Avigail’s fashion and comfort test. 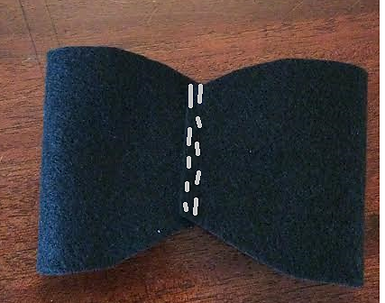 We decided that it was time to make some lightweight and fashionable bows of our own. We purchased some felt squares (29 cents each at Walmart!) 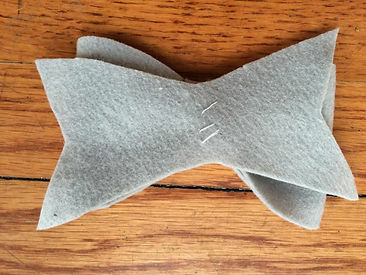 and created a template for making these bows. They are simple to make, beautiful to wear, lightweight and best of all, Avigail loves them! Click on link to 3-piece template to open and print on your printer. Cut out template pieces A, B and C.
Lay template on felt square, trace with a pen and cut out all three pattern pieces with sharp scissors. Thread a needle with thread coordinating to your felt color. 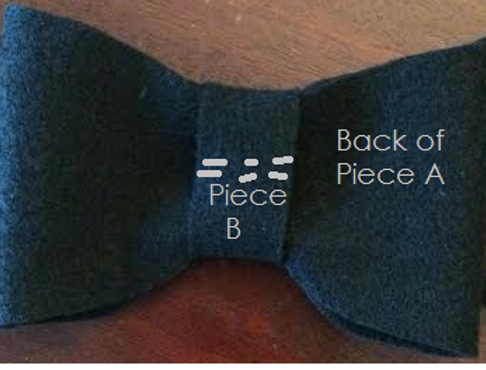 Bring ends of Piece A together overlapping slightly at the center (dotted line on template). Sew the ends firmly together at the center. Surround sewn piece A with piece B, making sure to pull piece B tightly around piece A. This will create a loop around Piece A and pleat Piece A slightly. Secure ends of loop by sewing together. Sew piece B to back of sewn piece A through the back layer only. Sew securely to reinforce bow. 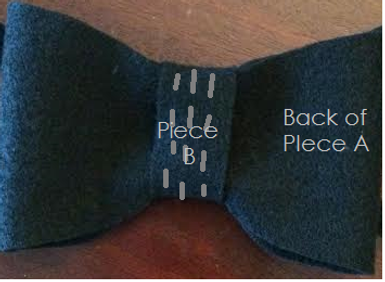 Center and sew Piece C to the back of the bow. 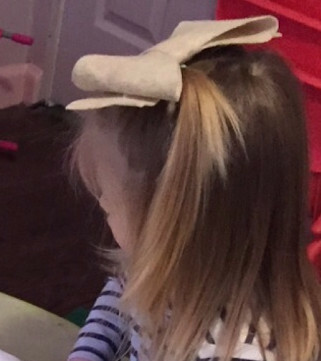 Center and glue hair clip to back of the bow securely using a glue gun. Voila! You now have a lightweight and gorgeous hair bow. My daughter, Kaitlyn, creates the cutest costumes ever! This is one of my favorites. This robot costume is one that she designed for her husband, Aaron, to wear on Purim. There is a custom to dress up in disguises on Purim to commemorate the events in ancient Persia whereby the Jewish nation was saved from a terrible decree of extermination. Unlike the outright miracles in the Jewish exodus from Egypt commemorated on Passover, the Purim story is one of natural events coordinated in such a way that the “hidden hand” of G-d was evident. We dress up on Purim to commemorate the disguised miracles for the Jewish people in Ancient Persia. This robot costume is designed entirely out of dollar store and upcycled finds and it is creative, practical and very unique. Kaitlyn scoured her local dollar store for items that she could use for this costume. You may find other items to use that will create your own robot design. Please feel free to share your own designs. My mother is Savta (Hebrew for Grandma) to my children and grandchildren. Savta is the most wonderful grandmother ever, always on the lookout for something special for all her grandchildren and great grandchildren. Savta loves to knit and she recently knit my two-year old granddaughter the most adorable pocketbook ever. Avigail feels so grown-up carrying her own pocketbook. She has filled it with her own stash of emergency items, just in case. Inside, you’ll find snacks, tissues, a hair bow and her favorite book. I myself don’t knit, but my mother is a master knitter and crocheter. When I was a small girl, she crocheted ponchos (remember those?) and matching skirts for me. When I was a teen, she knit and crocheted beautiful sweaters with puffy ribboned sleeves for me. Now, she knits all kinds of items for the next two generations.